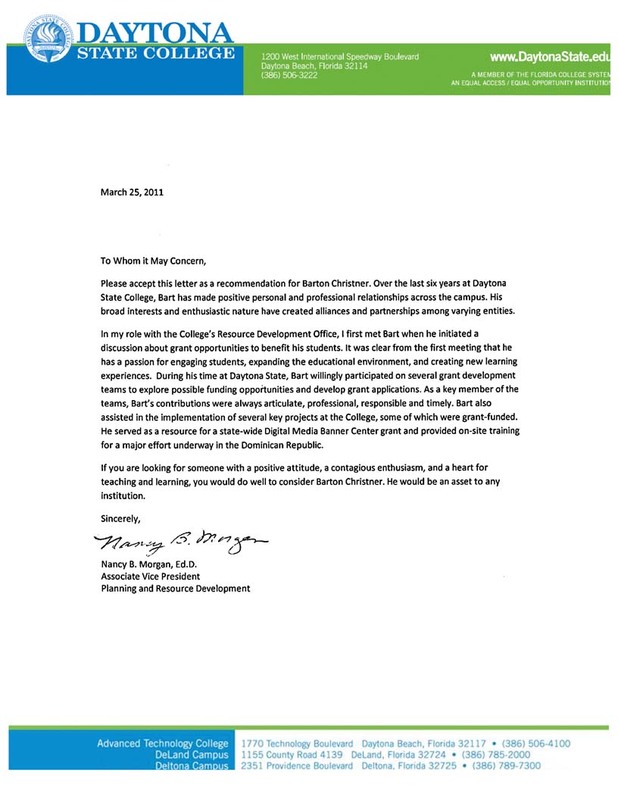 Please accept this letter as a recommendation for Barton Christner. Over the last six years at Daytona State College, Bart has made positive personal and professional relationships across the campus. His broad interests and enthusiastic nature have created alliances and partnerships among varying entities. In my role with the College's Resource Development Office, I first met Bart when he initiated a discussion about grant opportunities to benefit his students. It was clear from the first meeting that he has a passion for engaging students, expanding the educational environment, and creating new learning experiences. During his time at Daytona State, Bart willingly participated on several grant development teams to explore possible funding opportunities and develop grant applications. As a key member of the teams, Bart's contributions were always articulate, professional, responsible and timely. Bart also assisted in the implementation of several key projects at the College, some of which were grant-funded. He served as a resource for a state-wide Digital Media Banner Center grant and provided on-site training for a major effort underway in the Dominican Republic. If you are looking for someone with a positive atitude, a contagious enthusiasm, and a heart for teaching and learning, you would do well to consider Barton Christner. He would be an asset to any institution.